I have an obsession with small, cute things. I especially love cupcakes. They’re perfect for one person, with just the right amount of frosting & there’s just enough room to put some finishing touches, such as sprinkles & a cherry on top. What’s cuter than a cupcake? 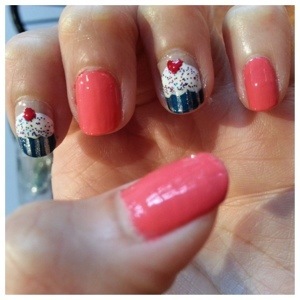 Cupcakes on your nails! The process was fairly easy, but it’ll take some time for each layer to dry before moving on. I did put too much “frosting” on 2 of my nails, so it got mushed up when I went out. I’ll have to remember not to do anything until it’s completely dried. 1) I always take paper from the recycling bin (this was an Rite-Aid ad) to test out color combinations first. This makes it easier when it’s time to actually paint my nails because I already have an idea how it will come out. Plus, some colors just do not go well together. 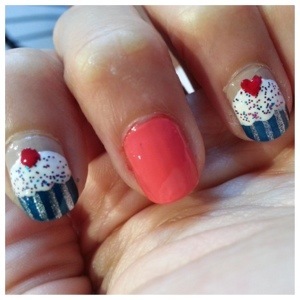 7) Use a Dotting Tool or a toothpick to create the “cherry” on top. 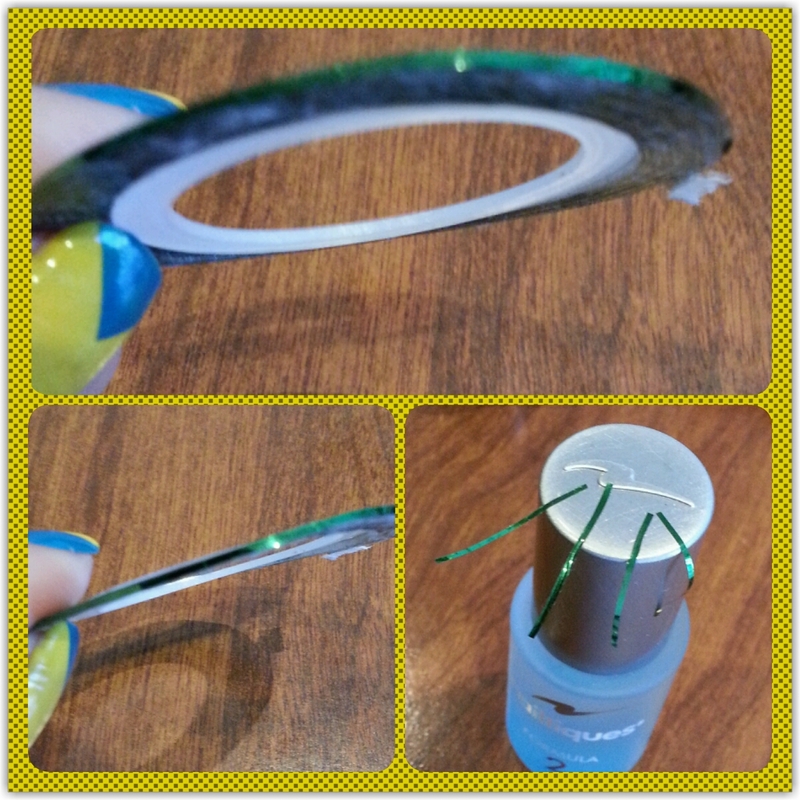 Dip your tool into the polish color to create a circle. I used a toothpick to create the heart. 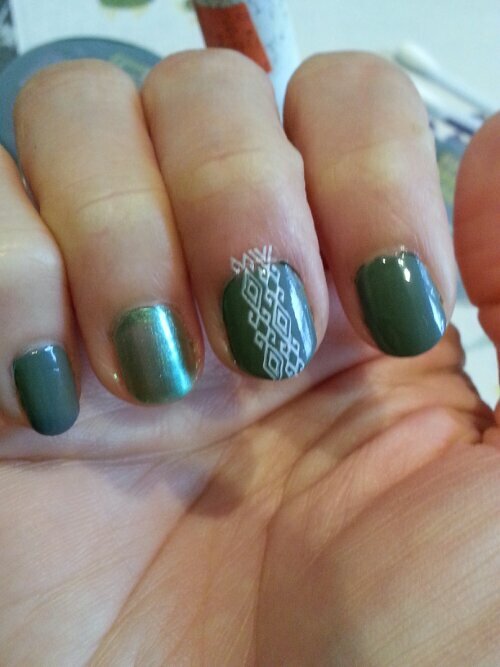 Practice on paper first so you can get it perfect on your nails on the first try. 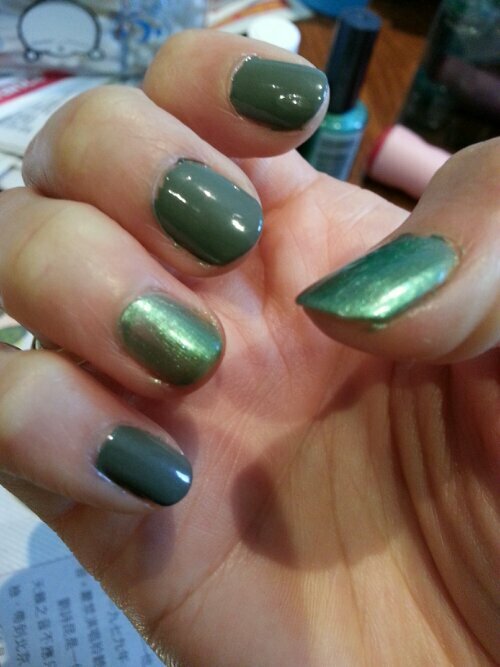 (Nailtini – Mango Rita) When everything is completely dry, add a clear top coat. This is possibly the cutest nail design I’ve done so far. I’m so happy with the way it came out. I’m sure I’ll go through all the colors of the rainbow to create more cupcakes in the future. Hope you like this tutorial! ENJOY! 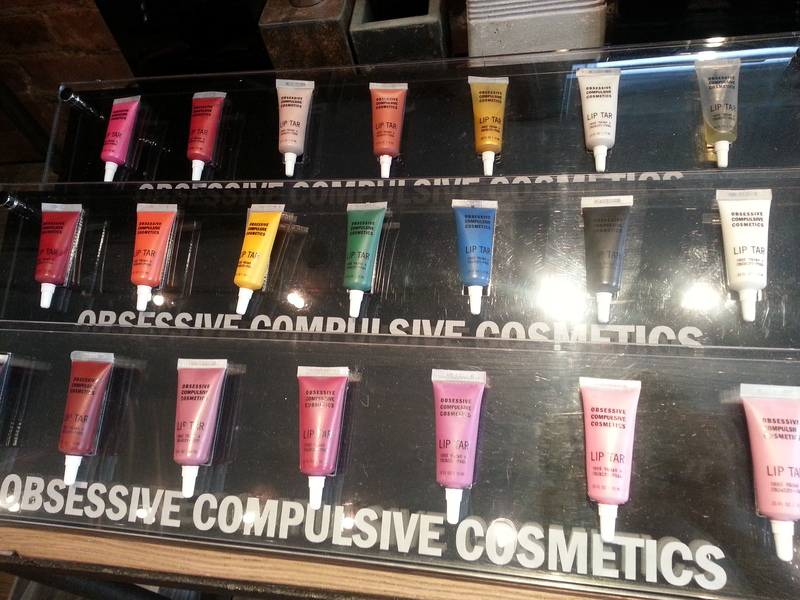 I decided to walk into this store since I love looking at new cosmetics, even if I don’t buy anything. The store didn’t look like much. There were a few tables on both sides & the cashier in the far back. There were 2 associates who greeted us. One came by to talk to us about the products. They are 100% Vegan & Cruelty Free, which are 2 pluses. 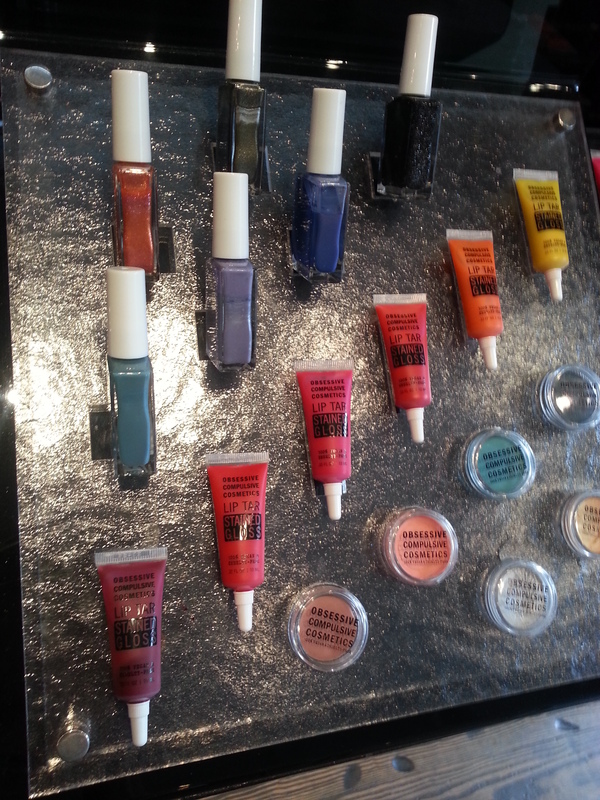 The star of their line are the popular Lip Tars . They come in a range of colors. Interestingly enough, they even come in blue, green, yellow & black! I am so not daring enough to rock those colors on my lips, but more power to the people who can. They come in a tube like a lip gloss would & you would squeeze a little out to get a bright lipstick-like color, or use even less as a lip stain. You can also use it as a blush as well. The reds are really nice. They retail for $18-$25. 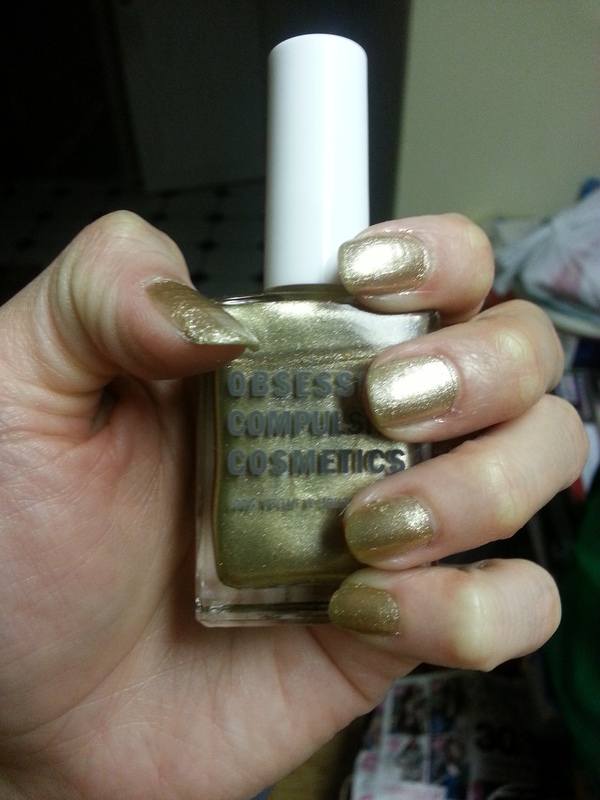 I couldn’t wait to use the colors so I ended up using Cruising as the base, which is a nice gold metallic color. 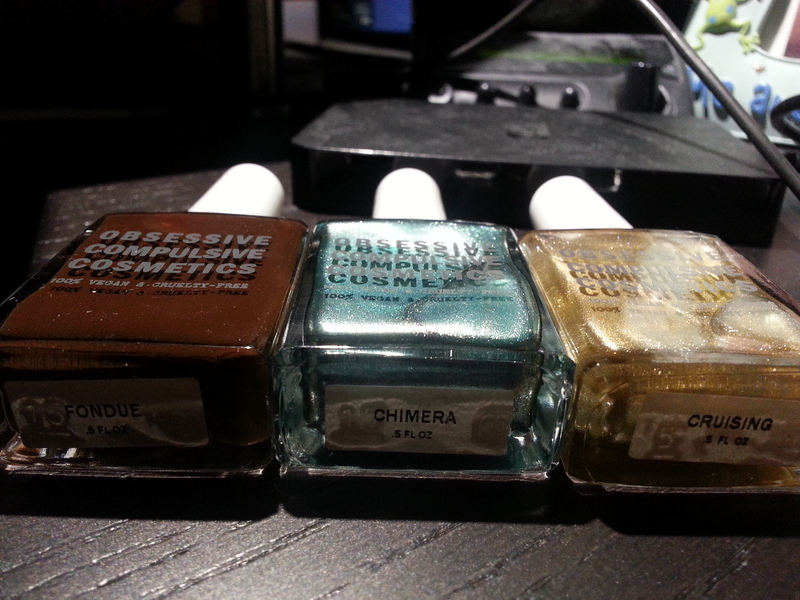 Then, I simply swiped Chimera, a nice metallic blue/green at an angle at the edge of my nail for a simple design. 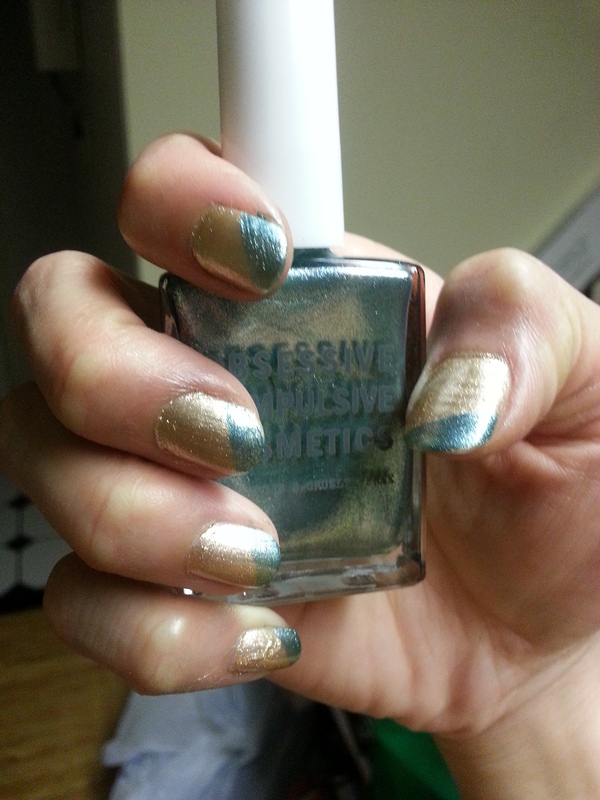 The polishes are highly pigmented which meant I didn’t need multiple coats for nail coverage. I love the way they shimmer in the light. They went on smooth, without any clumps & they dried quickly. My nails were done in less than 15 minutes. If you are in the neighborhood, stopping into the store could be beneficial for you. After getting home, I looked up reviews on the product. 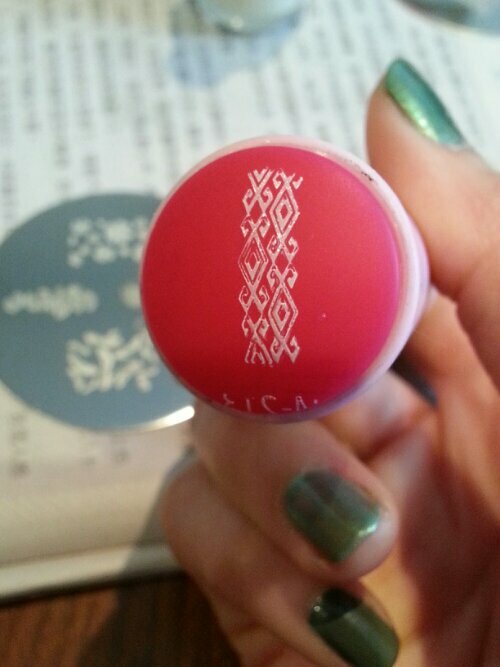 I looked on Yelp & saw many people saying if you check-in on Yelp, you’ll get a FREE nail polish. I was kicking myself for not checking in. *sigh* Plus, I have a love/hate relationship with Yelp as well. That’s another story to be told at another time. I think I really love them. 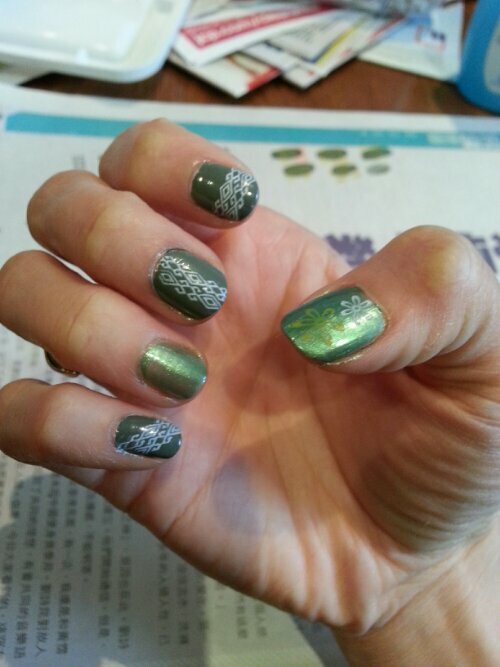 I can’t wait to do other nail art with them. What do you think of the colors? 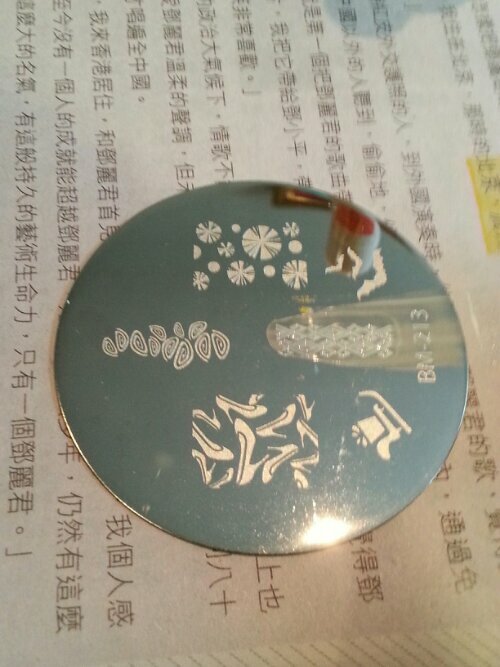 This design is very simple to do. It took less than 30 minutes from start to finish. I didn’t take pics when I did my hands, so I’ll show you with my toe. The yellow looked a bit bland, so I figured I’d do the big toe to dress it up a bit. 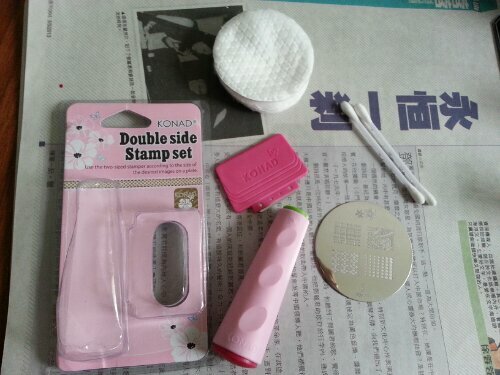 I bought Nail Tape on Amazon.com . It should cost you no more than $2 for 10 rolls. They are tiny rolls but they last a long time. 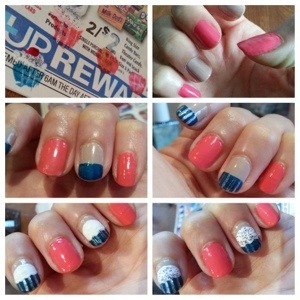 Cut them into strips before you start on your nails. This will make everything easier for you later on. I like them slightly longer so it’s easier for me to peel them off when I’m done. You first put your base coat & let that dry. Then you put your first color (I did yellow). Let that dry completely otherwise the tape will pull off your color, which will cause a mess & you’ll get really frustrated. Been there, done that. Use the tape to create your triangle. If the point looks off, carefully peel the tape off & try again. Once you have the shape you want, apply the accent color (I used blue). 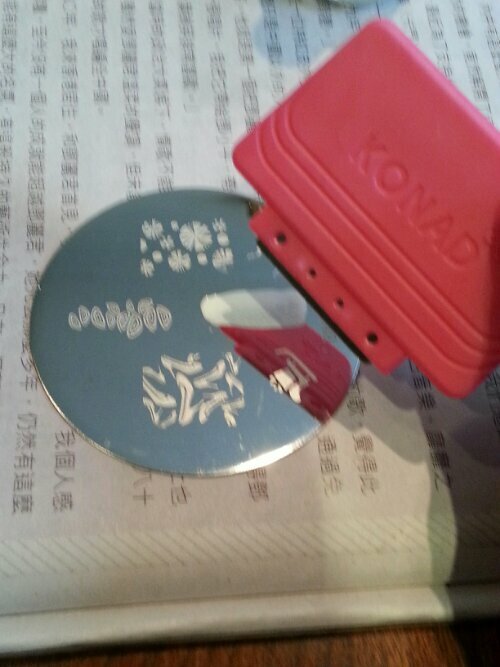 Let that set for a minute, then carefully peel the tape off. Let that dry then finish everything off with a top coat. Simple & quick. Note: I find that using a darker color for the accent works best. 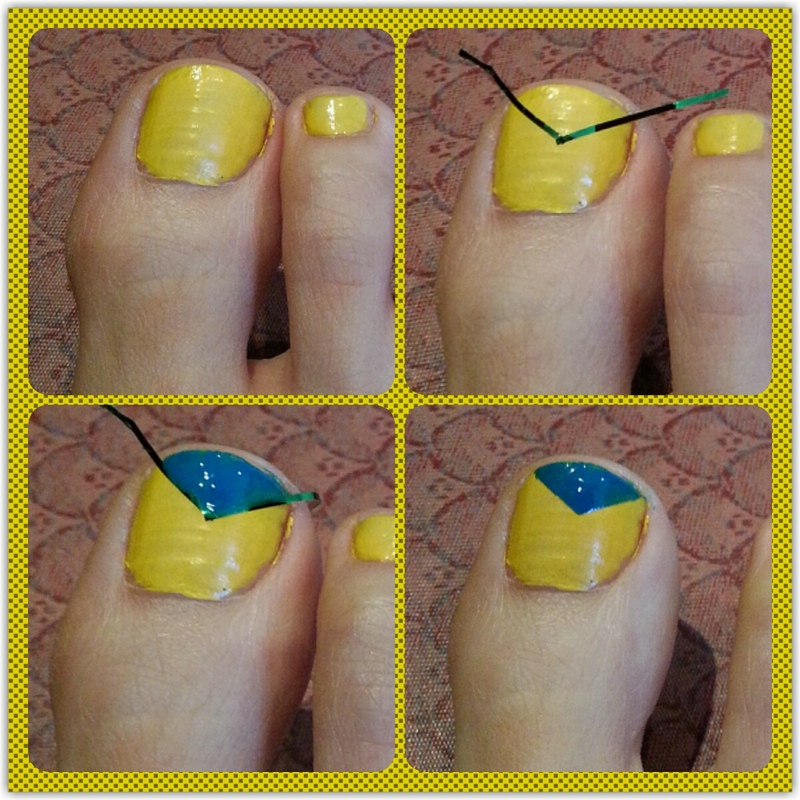 The yellow accent (on my index finger) started mixing w/ the blue & turned green, but I added more yellow to cover it up. Now rock your summer nails with a hot dress! ENJOY! 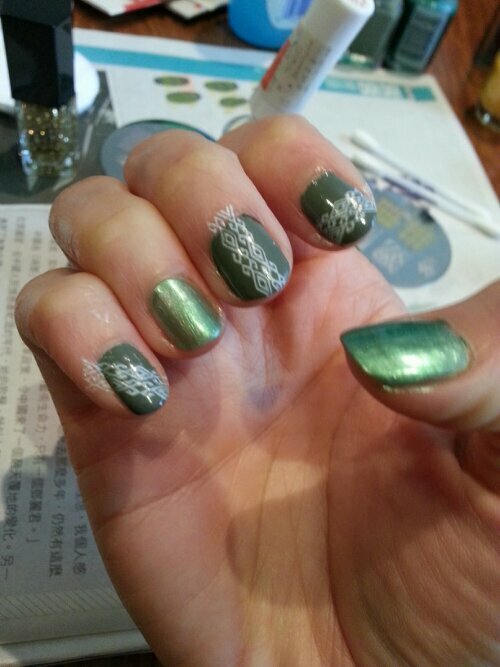 Nail Tape – 10 rolls last a long time. 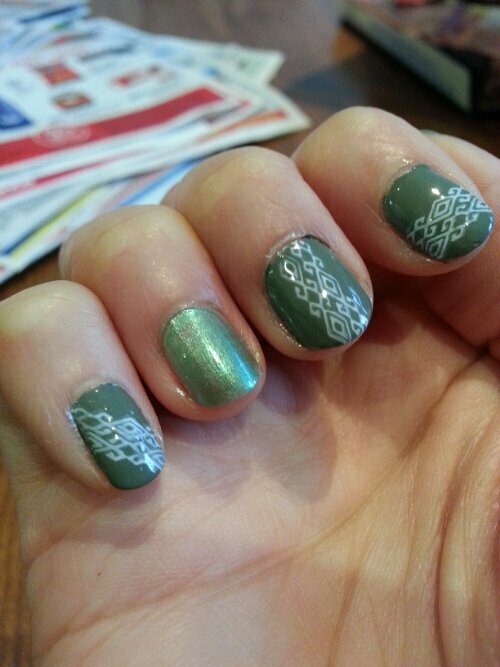 Nail Tape – 30 piece so you’ll never have to worry about buying tape ever again! L.A. 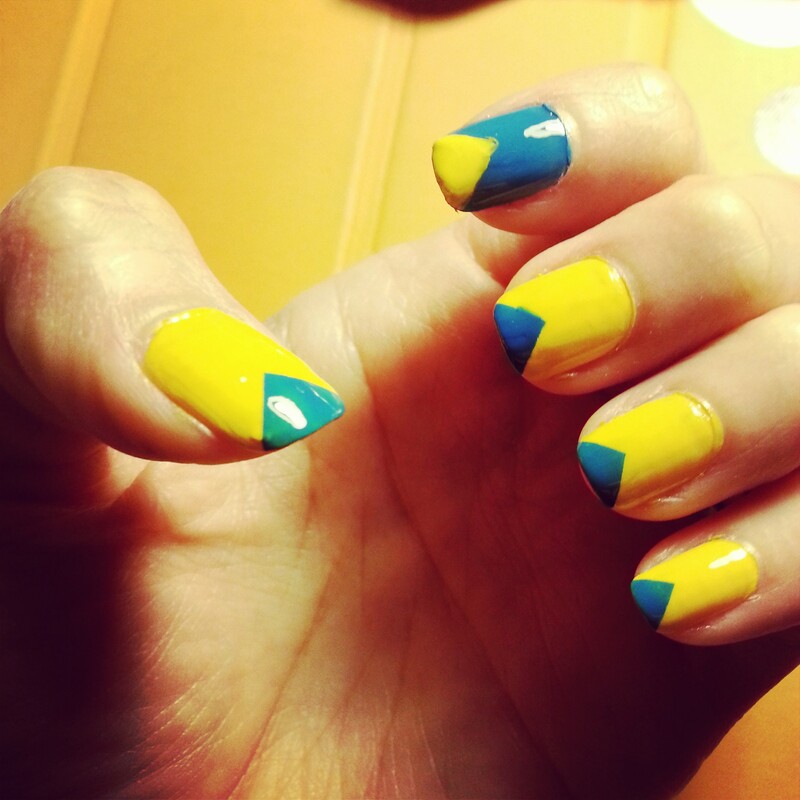 Colors Nail Polish – I got the Blue & Yellow Nail Polish from this brand. They are thick so it provides great coverage with one coat.